How far would you go to get hold of your favourite Scotch? In the case of Charles Patter, an 800-mile round trip by plane to purchase a £32.49 bottle of single malt. 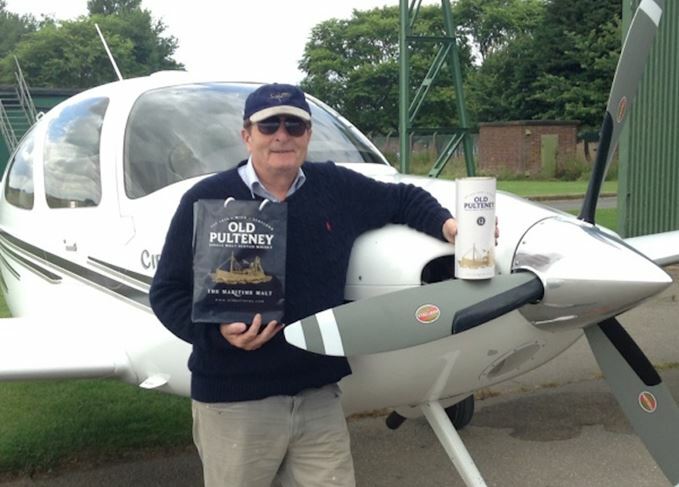 Charles, 67, left the staff at remote Pulteney distillery in Wick slack-jawed in surprise when he turned up earlier this month – having flown there by private plane from North Coates airfield in Lincolnshire, close to his home. He took the opportunity to enjoy a distillery tour, bought a bottle of Old Pulteney 12-year-old – priced on the distillery website at £32.49 – and was home in time to sample a pre-dinner dram the same evening. ‘I first sampled Old Pulteney whisky at a party, and loved it so much I decided to make a special trip to Wick to pick up a bottle,’ Patter told the Old Pulteney blog. Old Pulteney senior brand manager Margaret Mary Clarke said the entire distillery team were impressed by Charles' efforts. The ‘ultimate maritime malt’ has introduced three new whiskies plus a new design. The last UK stocks of the Wick distillery’s discontinued expression are offered for sale.